And that describes Advance Care Planning in a nutshell. Planning for our death. And as we have discussed so many times before, it’s a fact of the human condition. We’re terminal from the moment we’re born. Nothing like a little sunshine for your day…. And so, now we get into the nitty-gritty of advance care planning. Mom and Dad have thought way more about this than either I or my brothers have. And so, here is what I’ve learned in the past few weeks. Kind of a crash course in end of life planning. Each of these directives allows you to make decisions about the care you would want to receive if you happen to become incapacitated and unable to speak for yourself, likely scenarios as the pancreatic cancer progresses and becomes terminal. These decisions are very personal, and should be thought through carefully. Your values and beliefs will guide you as you consider these issues. Let me briefly explain each directive. Living will. This written, legal document spells out the types of medical treatments and life-sustaining measures you want and don't want, such as mechanical breathing (respiration and ventilation), tube feeding and/or hydration. Durable Medical Power of Attorney. This legal document designates an individual to make medical decisions for you in the event that you're unable to do so. This person is called a healthcare agent or proxy. Do not resuscitate (DNR) order. Do not resuscitate (DNR) order. This is a request to not have cardiopulmonary resuscitation (CPR) if your heart stops or if you stop breathing. For a more detailed explanation of each, simply click on the highlighted link to be taken to that page. Because these are legal documents, we urge you to contact a lawyer to work with. After you complete your Advanced Directives, be sure to keep a copy in a secure place, and then make copies for your family, healthcare proxy, your doctors and medical team. If during your pancreatic cancer journey you end up in the hospital... Actually that should probably read when, not if. Mom has spent more than her fair share of days at the hospital with a whole range of medical crises during this cancer journey. But, back to the point I was making. When you land in the hospital, you will most likely be asked to fill out a general advance directive form during the admittance process. Should you be a savvy cancer patient, you will already have a copy of your advance directives in your overnight bag that you so smartly packed... Trust us, when you arrive at the hospital, deciding on DNR's, Ventilators, and Medical Proxies, will be the last thing you have on your mind. If all this planning just seems overwhelming, then take a breath, go to dinner, put it down, walk away for a while. These decisions are meant to ease a family’s burden, not compound the stress. The ultimate reason for planning now is to enable each one of us the gift of dying with dignity. Making sure our wishes are followed, at a time when we will be unable to express our strongest convictions. And to make things even simpler, take just 2 minutes and answer these 5 questions from the Engage with Grace; One Slide Project. 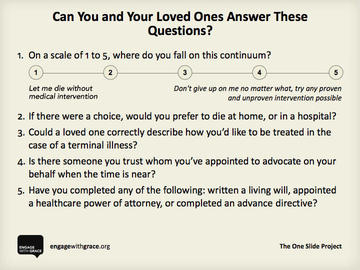 They were designed with one simple goal: to help get the conversation about end of life experience started. When committing to advance care planning, I encourage you, as always, to seek the advice of good legal counsel on these matters. I am not a doctor, nor am I a lawyer! 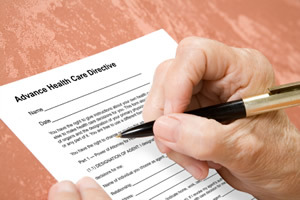 The preceding are just some basic facts about Advance Directives. Mom and Dad think these decisions are vital for their peace of mind. And knowing their wishes will be followed gives me a share in that peace.